Minutes before the live broadcast of the 2016 NFL Draft, Laremy Tunsil’s verified Twitter account was hacked—exposing a video of the former college athlete smoking weed out of a gas-mask bong—and instantly ruining his chances as a top five pick. 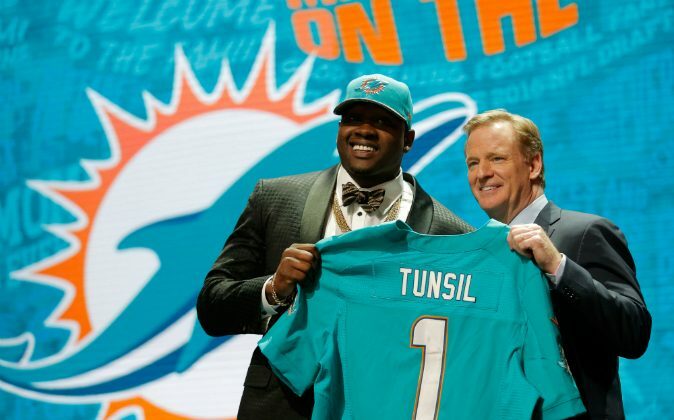 Tunsil, a highly-rated prospect out of Ole Miss, was eventually drafted by the Miami Dolphins as the No. 13 pick on Draft Day, April 28. The plummet from top five reportedly cost the 21-year-old $7 million in salary. “It is B.S. Somebody hacked into his account,” agent Jimmy Sexton told ESPN. According to Deadspin, someone has made several attempts to sell the footage of Tunsil’s mishap. Once Tunsil was selected by the Miami Dolphins, his Instagram page was hacked. This time, screenshots of a conversation between the athlete and Ole Miss assistant athletic director John Miller were released. In the text message, Tunsil writes: “Coach, I need help paying my rent,” in which Miller responds with, “see Barney next week”—presumably assistant athletic director, Barney Farrer—a violation of NCAA rules. During a post NFL draft news conference, Tunsil confirmed it was him in the video and that he did accept money. But such actions didn’t deter the Miami Dolphins from choosing the gifted athlete. Tunsil reassured reporters and his new team that his previous actions aren’t a testament of his character. “You can check all my college tests. I never failed one,” he said. Friend and college teammate, Robert Nkemdiche, vouched for his friend. Tunsil doesn’t plan to take legal action against the hacker, but said “we’re trying to find out” the identity of the culprit.